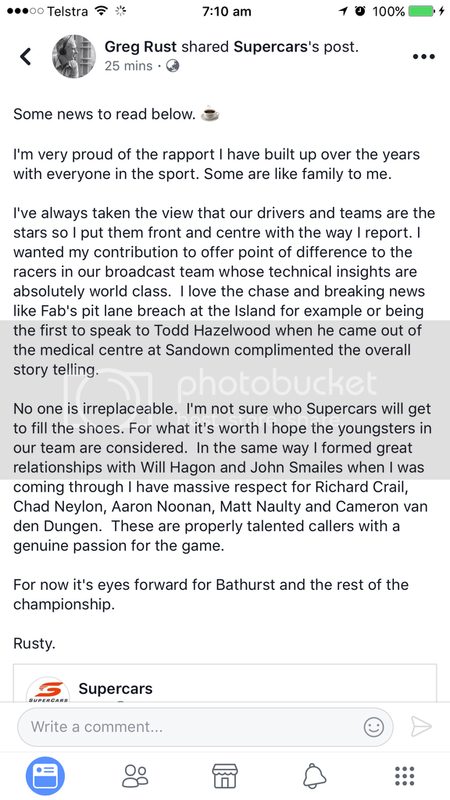 Mr Rust actually took the time to understand the ins and outs of the sport he covered, speaking as an expert, yet deferring to the teams and drivers where it made most sense for the broadcast. One of the few in the box to not play favourites, Mr Rust definitely helped a number of people behind the scenes to get done what they needed to get done. Wish him well in his next adventure. where is he going and why is he leaving? Reading the story Im still figuring out-did he jump or was he pushed? I'm sturggling to believe it's a role he'd walk away from, of his own free will. Seems like he's been pushed out. Firstly as host of Inside Supercars and now from the coverage entirely. Unfortunately seems to be the way things work nowadays. 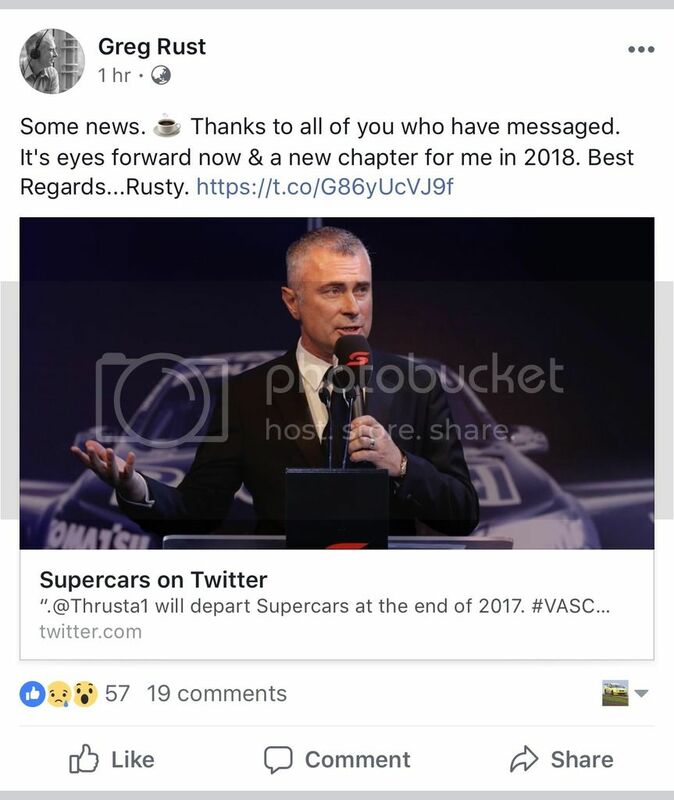 Its Supercar TV's loss and a major one at that. Everyone is expendable but to see someone like that who has a still a lot to offer in his roles moving on is sad to see. It sounds for all the world like Mr Rust's contract was not renewed. So everyone's awkward with Mr Crompton? I'm struggling to believe it's a role he'd walk away from, of his own free will. weird, he always seemed like the "nice guy"
As one of Rusty's friends, I can assure you the nice guy is not an act on his behalf, what you see is what you get. I can't tell 100% why he's jumping ship but I won't be surprised if it's for family reasons. He's got a rather young family and pretty sure he wants to be there for them. Being on the road for bulk of the year is hard on a family plus on oneself. Maybe not only for family reasons but to recharge the batteries. He says he'll stay in the media, maybe back to his roots on SBS Speedweek?